The 1985 Oldsmobile Ninety-Eight Regency sedan was substantially downsized from the previous year and switched to front wheel drive. Overall length dropped over two feet from 221.1 inches to 196.1 inches. Standard power (if you could call it that) came from the LK9 110 bhp 3.0 liter/181 ci V6 with a two-barrel carburetor. Optional engines were the LG3 3.8 liter/231 ci multi-port fuel-injected V6 putting out 125 bhp and the LS2 4.3 liter/261 ci V6 diesel (don’t do it!) putting out all of 85 bhp (at least it had 165 lb-ft of torque). All engines were teamed with a four-speed automatic transmission. 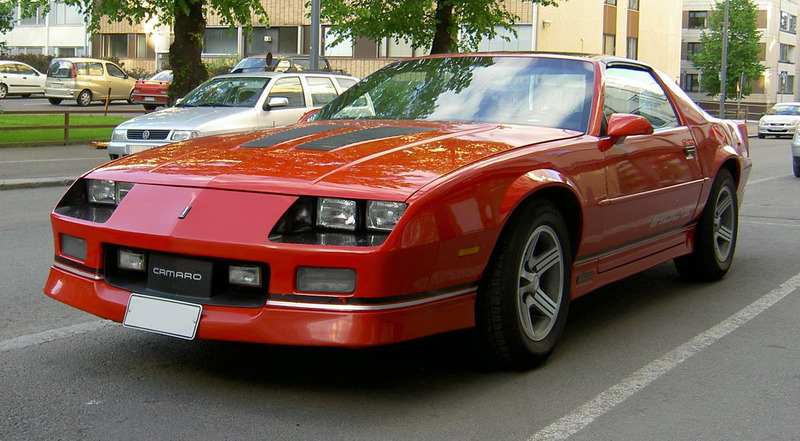 Both the 3.0 liter V6 and the diesel V6 would be gone by the time the 1986 model year rolled around. Mileage for the standard engine was 18 city/25 highway by the 1985 measures (16/23 by today’s standards). Hilariously, the upmarket 3.8 liter engine was rated at 19 city/26 highway, the multi-port fuel-injection more than making up for the increased displacement. Buyers of the diesel could expect 22 city/32 highway. With an 18-gallon gas tank, a Ninety-Eight Regency owner could expect a range of about 315 to 350 miles with a 10% fuel reserve. The target market probably didn’t care about 0-60 times, which was a good thing; the best case was likely about 12 seconds. Standard mechanical equipment on the $14,665 (approximately $35,100 in 2019 dollars) Ninety-Eight Regency included an automatic leveling system, power rack-and-pinion steering, power front disc brakes, and P205/75R14 steel-belted radial-ply white-stripe all season tires (a size still available thanks to Hankook and Kumho) on 14-inch wheels with bright deluxe wheel discs. Inside, four-season air conditioning, an AM/FM stereo radio, a six-way power driver’s seat, power door locks, power mirrors, and power windows were all standard. Stepping up to the $15,864 (approximately $37,900 in today’s dollars) Ninety-Eight Regency Brougham made the 3.8 liter engine standard and added simulated wire wheels with locks, fancier seats, a deluxe steering wheel with tilt-away feature, and intermittent windshield wipers—along with over 300 pounds of weight. Optional items included Astroroof ($1,230), cornering lamps ($60), electronic air conditioner ($125), and twilight sentinel ($60). These C-bodies (there were also Buick and Cadillac versions) had a stately look about them. Big and (I think) handsome, they had a lot of interior room despite the downsizing—at 110 cubic feet, they had only two cubic feet less than the 1984. Page from the 1985 Oldsmobile Ninety-Eight Regency brochure, linked from the Old Car Manual Project’s amazing brochures section. Sales of the 1985 Ninety-Eight Regency sedan were good—at almost 155,000, more than double the approximately 69,000 that had been sold in 1984. A little over 70% of Regency buyers chose to move up to the Brougham. C-body Ninety-Eight Regency sedans sometimes come up for sale in the Hemming’s Motor News classifieds and on eBay Motors. 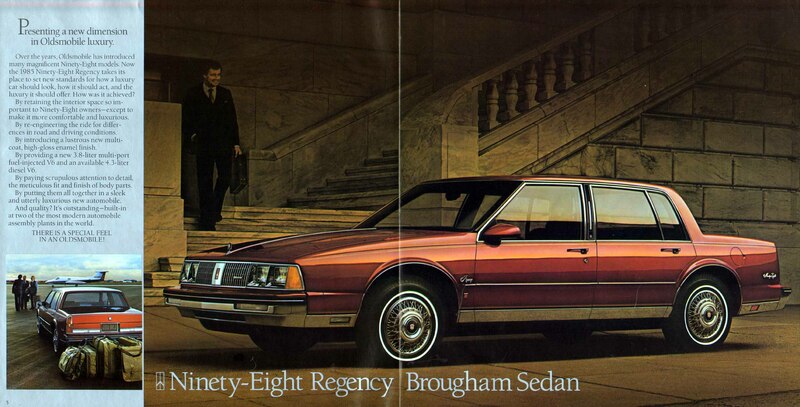 As I update this blog entry in February 2019, there’s a Brown Metallic 1985 Ninety-Eight Regency Brougham with medium beige cloth seats, a 3.8 liter V6, an automatic, and 131,000 miles advertised for $10,000. Make mine Platinum Metallic, please. When it debuted for the 1985 model, the Ferrari Testarossa had big shoes to fill—it replaced the undeniably beautiful Berlinetta Boxer which itself had replaced the undeniably beautiful Daytona. 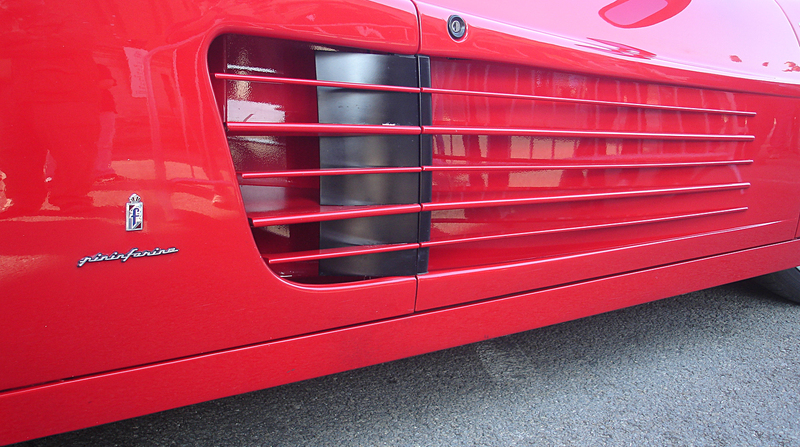 Close up of the “cheese grater” side strakes on the Ferrari Testarossa. The strakes were at least functional, feeding the two side radiators that cooled the Bosch K-Jetronic port fuel-injected 4.9 liter/302 ci 380 bhp flat 12 cylinder engine—crazy power for the mid-1980s. Mileage (not that the target market cared) was flat-out awful—10 city/15 highway by the standards of the day (9/14 by today’s standards). At least the 30.4-gallon gas tank meant you could go around 315 to 340 miles before looking for more fuel. The Testarossa was a Ferrari that reflected the times—it was big (almost six inches wider and 200 pounds heavier than the Berlinetta Boxer it replaced) and flashy. It was also pricey; at $90,000 and up (over $215,000 in 2018 dollars), four times as expensive as a 1985 Corvette (not that too many buyers were cross-shopping the two). You did get at least a little comfort for your money—air conditioning, power seats, and power windows were all standard. There continues to be disagreement over how good a car—or, more importantly, how good a Ferrari—the Testarossa was. It was undoubtedly fast: 0-60 came in 5.2 seconds, and top speed was about 180 mph. There is strong club support for the Testarossa, as there is for all Ferraris. According to Hagerty’s valuation tools, all the money for a 1985 Testarossa in #1/Concours condition is $132,000, with a more “normal” (if any Ferrari can be normal) #3/Good condition car going for $80,000. You see them advertised in the Hemming’s Motor News classifieds, though often it’s a notice of an auction. There is a Rosso Corsa Testarossa with the tan interior and 21,000 miles advertised for $108,000. Make mine that same Rosso Corsa, with the tan interior. My wife prefers the “Miami Vice” white, but I think Testarossas (along with many Ferraris) left our list forever when she found out that you or your very expensive mechanic have to remove the engine from the car to do a “major service” every five years or 30,000 miles.